DENTON, Texas--(BUSINESS WIRE)--Peterbilt has announced enhancements to the Model 579 EPIQ package that deliver an eight percent fuel economy improvement for the 2018 model year. Peterbilt’s Model 579 EPIQ is available with the fuel-efficient PACCAR MX-13 and MX-11 engines and is paired with the Fuller Advantage automated transmission to provide a wide range of horsepower and torque ratings. Fuel economy improvement incorporated into the 2017 MX engines result in up to four percent improvement over the prior model year. Additionally, both PACCAR engines reduce weight by approximately 50 pounds and extend service intervals for more uptime and lower maintenance costs, estimated at $1,000 less per truck at 600,000 miles. The 2017 release of Predictive Cruise Control on the MX engine provides additional fuel economy improvements of up to three percent. Predictive Cruise Control utilizes onboard maps and GPS information to maximize the truck’s own kinetic energy and determine the optimal vehicle speed as it approaches a hill. As the truck crests the top of the hill, the system engages the engine brake as needed to curb the vehicle speed as it approaches the bottom of the hill. The recently introduced PACCAR 40,000 pound tandem drive axle is also standard with the Model 579 for line-haul applications. Its innovative design optimizes power distribution and has fewer parts for reduced maintenance, greater reliability and a 150-pound weight savings. It features a unique through-shaft design that optimizes power flow in the forward rear axle for maximum efficiency and minimum oil churning losses, resulting in a one percent fuel economy improvement. 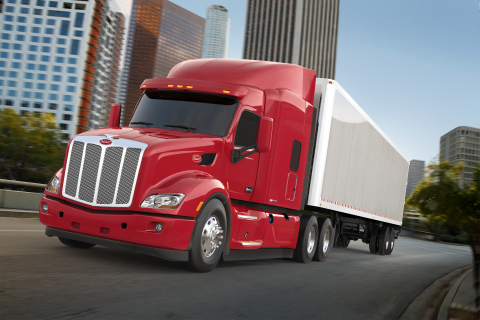 Peterbilt has also introduced new interior color options, automatic interior temperature control for the Model 579 and several other features to improve driver comfort, the company has announced. The Model 579 offers two new interior colors: Sterling Gray and Saddle Tan. Both are available in Prestige, Premier and Platinum interior levels. These new colors offer an enhanced appearance, commensurate with Peterbilt standards of styling and quality. Enhanced comfort features of the Model 579 include updated Auto Start/Stop technology on the Peterbilt SmartAir® No-Idle Sleeper Air Conditioning System on Model 579 tractors equipped with 72-inch or 80-inch sleepers. The system can provide increased engine idle charging with idle rates as high as 900 RPM for quick charging power. Another comfort-focused design is the all-new larger sleeper window to improve comfort, increase ventilation and improve aerodynamics. The new 22-inch x 24-inch sleeper window provides a tilt style opening increasing air flow and natural light throughout the interior. Peterbilt continues to engineer new technologies and innovations into its popular Model 579, with recent updates to its EPIQ package, interior colors and automatic interior temperature control.